Pam Strayer, author of “What’s on Those Vines”, Organic Wines Uncorked, speaker and several blogs enlightens us again. Please support Pam and visit her informative website: winecountrygeographic.blogspot.com/ . She also does wine tours to the best Napa and Sonoma wineries that are organic and biodynamic. A wine app and wine list/newsletter is being rolled out this year. We love her! Note: See our story, “Degenerative Food & farming System Poses Mortal Threat” that cites new studies showing men born in 1960 will have a cancer risk of 53.5% in their lifetimes and 47.5% for women. 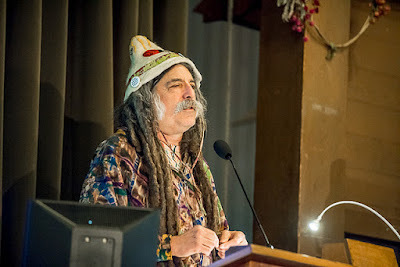 In a rousing speech at Ecofarm, the organic farming conference, Amigo Bob Cantisano, one of the founders of CCOF, accused the state and federal government of fraud in testing food for pesticide residues, claiming that state officials test only 181 out of 1,048 active ingredients. Cantisano, who has been battling cancer for the last six years, said he was concerned about health effects of pesticides. “We’re all being mollified that all that conventional food, which most of us are eating most of the time is safe. It’s not,” he said. Official procedures for determining food safety are flawed from start to finish, Cantisano said. Cantisano said he came to his conclusions after repeatedly touring the California Dept. of Food and Agriculture (CDFA), where, he said, the testing machines are unable to analyze two thirds of commonly used pesticides. Firstly, Cantisano complained, the testing process for residues begins with washing produce for 15 seconds, a process which he says doesn’t reflect the way consumers treat produce. Secondly, the government tests aren’t performed on pesticide combinations or on the inert ingredients. In the recent glyphosate cases against Monsanto and Bayer for Roundup and other herbicides, university researchers in France and the U.S. have found that the inert ingredients are more toxic than the listed active ingredient – glyphosate – alone. Inerts are routinely used as 75 to 90 percent of the ingredients in pesticides, he said. Thirdly, Cantisano said the CDFA tests for only 343 of the listed 1,058 active ingredients, according to lists provided to him by CDFA officials, of which he claims only half are actively used. He said 16 of the 343 were metabolites or byproducts of pesticides that break down, bringing his count to 327 substances. Furthermore, he said, 146 of the active ingredients have not been registered in the state for 10 years and are no longer being used on California farms. Fourthly, Cantisano also said the solvent used to extract the pesticides produces inconsistent and inaccurate results. Cantisano called for the organic farming community to step up efforts to support the use of fewer pesticides in all forms of agriculture and to fight for improved and more accurate testing. Cantisano said communities were at high risk of diseases from pesticide use on food crops. “There’s a cumulative effect. Our livers, our kidneys are all paying the price for this. Pancreases, too. “Twenty five years ago I wanted to talk about this,” he said in his speech on the podium, “but I was afraid of being killed, like Dr. Van den Bosch from U.C. Berkeley’s Division of Biological Control. I just didn’t have the balls then,” Cantisano said. Van den Bosch, a world renowned scientist in the field of biological control, was widely credited with being the founding father of the integrated pest management (IPM) program in California, but his career ended with his death at the age of 56. Later his lab disbanded. “All the copies of his book back then were taken off the market immediately,” said Cantisano. (The book is now available as a reprint). An expert on organic farming as well as organic vineyards, Cantisano has helped dozens of wineries grow wine grapes organically, advising Frog’s Leap, Tres Sabores, Long Meadow Ranch, Preston, Martorana, Skipstone and many more over a 40+ year trajectory in the organic movement. “I urge us to work more – more farmers together, more farm workers together, more scientists together, more environmentalists together. And in your lifetime: please clean this damn place up,” he said in his closing remarks. A group of attendees signed an email list to come up with ideas to increase awareness and develop programs to broaden education about the issues Cantisano raised. Cantisano founded the Ecological Farming Association or Eco-Farm in 1981 when a group held its first conference in Winters. The group says it has reached more than 60,000 people with its educational programs. It also gives out awards to prominent organic and ecological farming visionaries including Robert Rodale, Vandana Shiva, and Alice Waters. On other fronts, new scientific reports released this winter from prominent authorities echo the health risks of pesticides in the food supply and mishandling of risk assessments by regulators at the EPA. In January, Consumer Reports and the Washington Post reported on a recent French study (published in the respected medical journal JAMA) that people whose diet is mostly organic reduced their cancer risk by 25 percent. The study followed 70,000 people over a four and a half year period. In January, a noted health researcher, Charles Benbrook, former executive director of the National Academy of Sciences board on agriculture, cited discrepancies in EPA’s data sources, using data submitted by pesticide makers that conflicted with data from peer reviewed scientific journals. His article, published in the peer reviewed journal Environmental Sciences Europe, says the EPA overlooked critical data on glyphosate. Benbrook also says the EPA looked only at glyphosate on its own, while the UN’s IARC experts looked at formulated products that contained glyphosate (the listed active ingredient in Roundup) in combination with inert ingredients. In addition, Benbrook said the EPA looked at general population health risks, not specialized risks for workers or residents who used glyphosate based products on a regular basis.